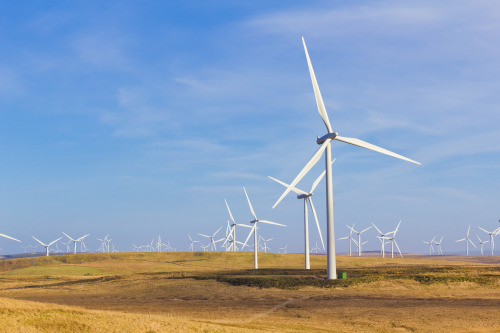 Whitelee Wind Farm near Glasgow is the UK's largest on-shore wind farm (Image courtesy of Shutterstock). A new report has shown that Scotland will miss its 100% renewable electricity target without further investment in onshore and offshore wind. The study, published by industry body Scottish Renewables, shows Scotland is on course to generate the equivalent of 87% of its annual demand for power from renewables by 2020, and highlights the need for further support from the UK Government if the target is to be met. Its release comes amid press reports of a leaked letter from the Secretary of State for Energy and Climate Change stating that the UK will miss its 2020 renewables targets. According to Scottish Renewables, there are consented schemes onshore and offshore that could help them reach their target, there, but these can only go ahead if they are allocated a long term contract for their power. The industry had expected an auction round for contracts this autumn, but according to Scottish Renewables, UK ministers postponed this, leaving them unsure if and when it will be rescheduled to go ahead. Niall Stuart commented that this would inevitably impact on investor confidence across the industry. “If we don’t start the process by next spring," he continued, "the delay could fatally undermine the timeline for the projects on Scotland’s main island groups, ending prospects for major developments on the Western Isles and Shetland. It would also raise serious questions about whether the proposed offshore wind projects can make the 2020 deadline."